Evolving electronic fixed income venues will play a significant role in providing liquidity in the U.S. corporate debt market. Boston, April 23, 2015 – In the U.S. corporate debt market, low interest rates have spurred massive new issuance, and regulation has curtailed banks’ secondary market operations. 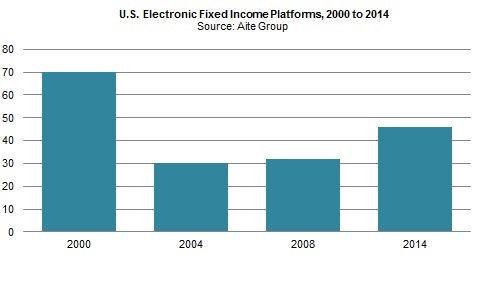 Asset managers and banks are now turning to electronic solutions to solve the perceived liquidity gap, and new waves of electronic trading platforms are sweeping the fixed income markets. This report is based on 12 Q4 2014 and Q1 2015 phone interviews and face-to-face meetings with market participants and covers the status of the U.S. corporate bond market, electronic fixed income trading, market liquidity, and new entrants into electronic corporate bond market trading. It introduces fixed income trading platforms from OpenBondX, Bondcube, Liquidnet, ITG, Electronifie, and TruMid. This 17-page Impact Note contains five figures and two tables. Clients of Aite Group’s Institutional Securities & Investments service can download this report.